Until I attempted to make this quilt, I had not sewn anything in nearly fifteen years. I had used my sewing machine all of once that time fifteen years ago, and I remembered none of it. This how-to is for those of you who want to make something awesome, but have no clue how, like I was. This project was to keep me busy during my husband’s deployment. He had many shirts that he had accumulated over his military career, plus others he just didn’t want to part with for whatever reason. I was tired of having them clutter up our storage so we agreed that someday I would turn them into a Quilt. Someday finally arrived, and I was lost. 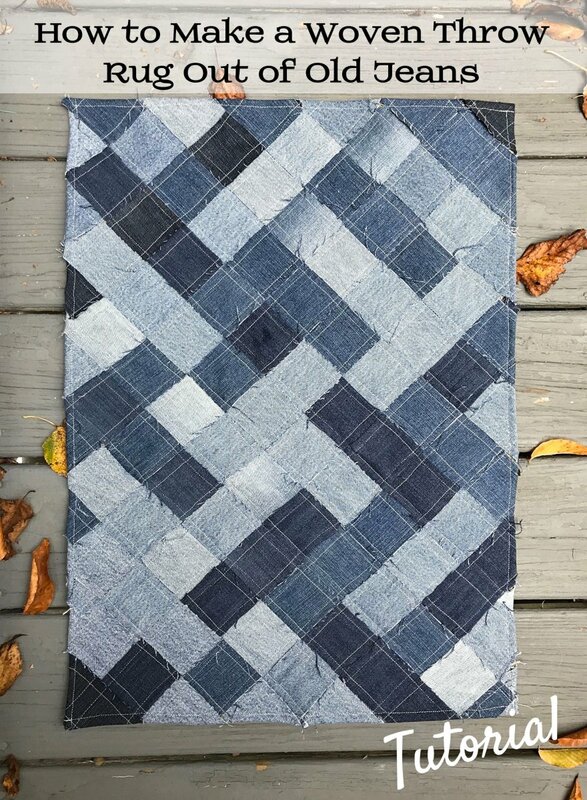 Here is step-by-step my unconventional way of making this quilt. 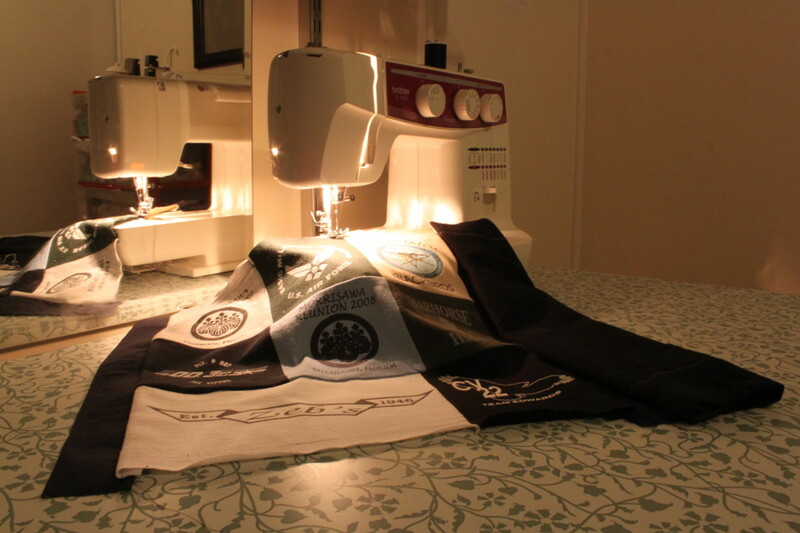 Watch YouTube videos on how to use your sewing machine. I can’t just tell you how to use it, because each is different. I read the manual that came with the machine (Actually extremely helpful!) and then watched a few YouTube videos to learn about tension, stitch styles, and how fast to sew. This video (to the right) was a lifesaver when it came to learning about my machine. I had no idea my sewing machine would wind the thread around the bobbin for me; I was doing it by hand! I decided that I wanted my quilt squares to be 12” by 12”. My husband’s shirts were all medium and large sizes so this worked out. Base the size of the squares on the size of the shirts. I chose a measurement that would allow most of the images to fit within that square. You also don’t even have to choose a square; rectangles will work just as well. I then figured out how large I wanted my quilt (big enough to cover my husband on the couch) and did some math to see how many shirts I needed to fill the quilt. I allowed for 1” borders around each square. I chose a basic dark blue cotton for the fabric that was to border the individual shirts. Be sure to pre-wash this fabric before you sew it on, as it will shrink a little bit and you don’t want it to scrunch up your quilt the first time you have to wash it. I pre-washed it then ironed it so it was flat and easier to work with. For the filler I cheated a little bit. 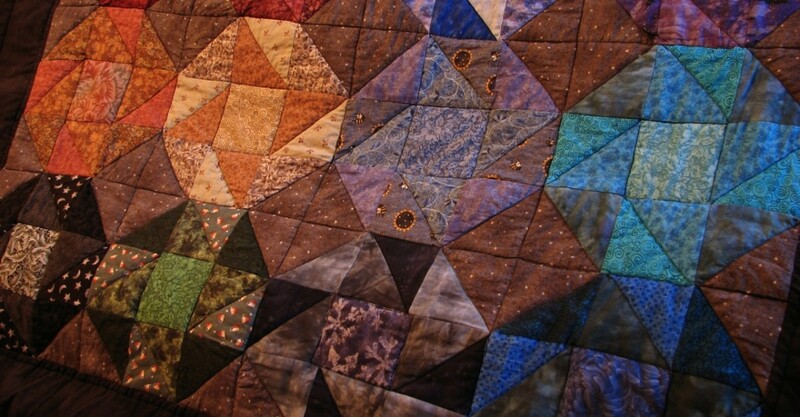 I knew my husband liked heavy quilts, and upon research I found the best way to get a heavy quilt was to cut up an old quilt and use the filling from it. I happened to have an old one that was falling apart and cut out the filling. However, most craft and sewing stores sell the filling (called batting) in different weights and sizes that you can buy. For the back I chose a soft plaid fleece. The back can be any fabric you want, even a basic cotton would work well. My husband is just partial to soft blankets. 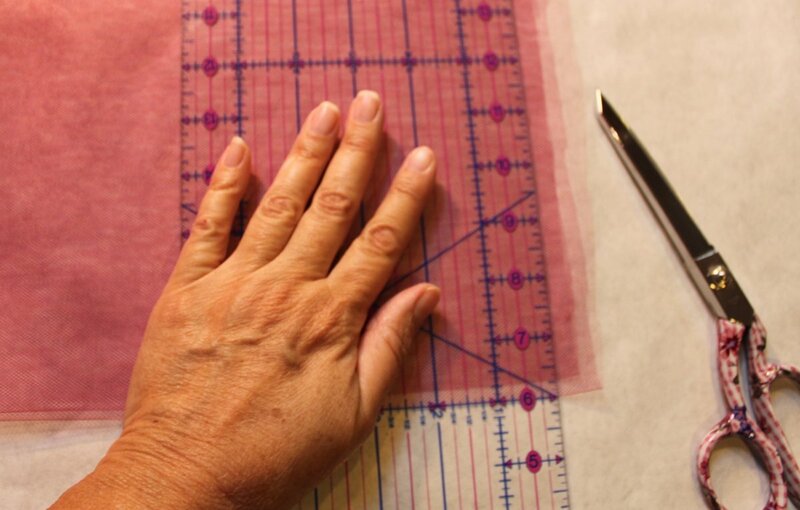 Now that you have all of your fabric, you can begin to measure and mark. I cannot stress that you should measure, then check your measurements twice more before cutting them. I made a template of a 12x12 square that I could trace onto the back of each of the shirts. Sewing stores like Joanne’s sell markers with ink that washes out. Use one of these, and mark your shirts. DO NOT CUT YET! Then comes the tricky part. For the 1” border that goes around the shirts, you will be cutting long strips of fabric, and short strips of fabric. For my quilt, I would have five rows, with four shirts in each row. For my quilt, I cut six long pieces – one for the top of the quilt, one to go in-between each row of shirts, and one for the bottom. This ran the length of the entire quilt, add up the length of each square plus add one inch in between each shirt. Then, you will want short strips to run between each shirt. I needed 15 strips that were 2” longer than each shirt, so 14” long, and then 6 strips that were 53” long. To get a nice 1” border that was straight, here is my cheater way: I bought 1” masking tape. I then laid out my fabric and ran the masking tape straight on the fabric, in the length needed (6 strips at 53”; 15 strips at 14”) using the help of a yardstick. I then cut around the masking tape leaving a liberal amount of fabric on each side so that it can be sewn onto the shirts. Leave the tape on, it will easily allow you to get a straight stitch and a correct width when you are putting it all together. I then cut my shirts. DO NOT cut on the lines you have drawn! Leave a couple of inches around the line when you cut, to allow for the pieces to be sewn together. The line marks what you want showing on the front of the quilt. I separated my shirts into five piles, one pile for each row. I then ordered the shirts so that they could easily be sewn in the correct order from left to right. I then pinned the shirt to the first of the short strips, lining up the edge of the masking tape with the line I had drawn on the shirt. When I made the quilt, I chose to pin a shirt to a short strip, sew it on, then pin the next shirt to the other side of that strip (one strip will attach 2 shirts together). Doing it over again I would pin an entire row together and sew it all at once. You can choose whatever is easiest for you. Just make sure that you are lining up all of the shirts, so that the top and bottom lines of the square you have drawn are all in a straight line – this is very important. Use the masking tape as your guide. I have a hard time sewing a straight line. I found it was really easy to position the needle right next to the masking tape, and just keep the stitch going along the tape. Once both sides of a strip were sewn, I could remove the tape. I had straight lines AND a perfect one inch border between shirts. Pin and sew some more. Once the short strips are all sewn to the shirts, you are probably feeling pretty good about yourself. This next step was the most fun for me because I could really see it coming together. I grabbed the long strips, and pinned one to the top of the very top row of shirts lining up the masking tape with the line drawn on the shirts. I sewed it on. I then pinned another long strip to the bottom of that row, and sewed it on. Then pin the next row to the bottom of that same strip, sew and repeat. It looks like a quilt now! Now that all the pieces are sewn together, wash them to remove the lines you have drawn. Once they are out of the dryer, trim the excess fabric from the shirts and the strips (not the strips around the outer edges!) and iron the seams flat. 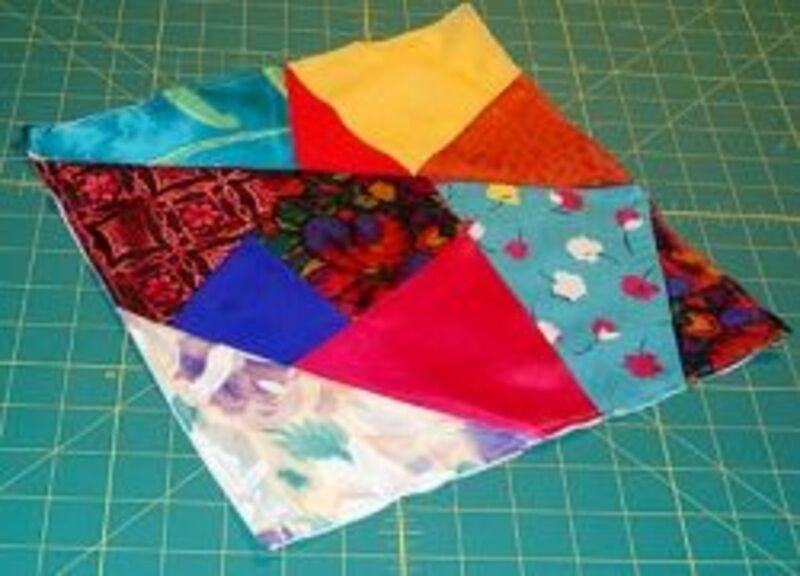 This will make your quilt look better and be more comfortable in the end. Now you need to get your batting (filling) and the backing for your quilt. Find a big place in your house where you can lay it out if you are like me and don’t have a huge quilting table. I chose my kitchen floor because I could use tape to help hold things in place. Lay out your backing (mine was fleece). Then place your batting on top of it, then your quilt top that you pieced together on top of that. I read that using a light spray adhesive helps to keep it all in place, but I did not have any so I used masking tape on my kitchen floor. I pinned all around the outer edges, and then along each of the strips (the ones running between the shirts) I used at least 10 pins per row between each shirt. I pinned in the middle of the dark blue strips, because I would be stitching along the edges of the strips later. Once you are done, carefully untape if that is what you did, and roll up the quilt to be carried back to your machine. 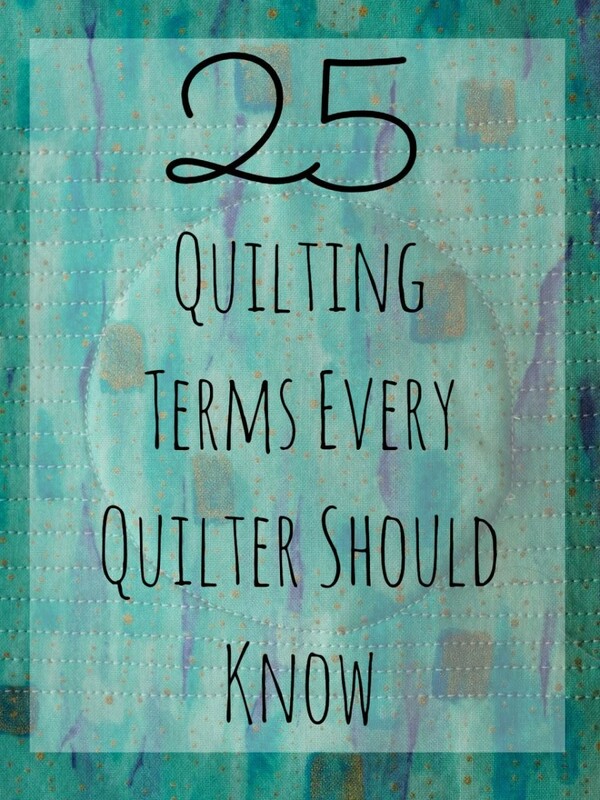 I read about a dozen different ways of quilting, the process by which you stitch the layers of the blanket together. I chose an easy way since I had no idea what I was doing. 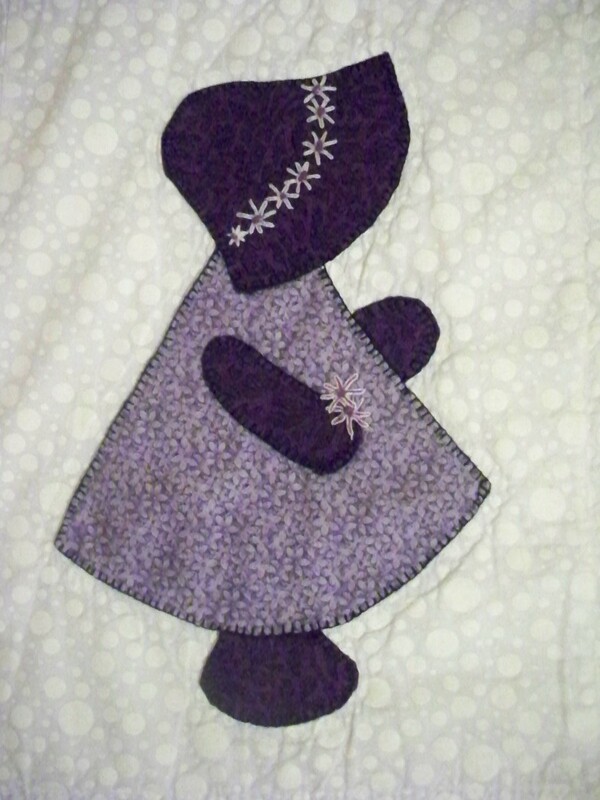 I decided that I would do something called “stitch in the ditch” where I basically sewed along every seam on the quilt. So, I sewed everywhere each shirt meets a blue strip. I did this in rows, so I essentially made 8 long horizontal lines of stitching, and then I made 6 very long vertical lines of sewing. It was easy to do the sewing near the edges of the blanket. The middle however took some figuring out. My sewing machine is small, my quilt is large. I discovered that if I pulled the blanket through, and rolled it up underneath the arm it really did all fit. It’s called the log method and it can be Googled for more detailed instructions. For another method, check out this video to the right, she uses the squish method. I will not even try to explain this part, as I did a pretty good job of botching it myself. Binding is where you get that nice finished edge to your quilt. There are a few different ways, and the video to the right ended up being my favorite way except I didn’t get the corners right…but they look okay anyhow! It’s your first project; don’t expect it to be perfect. Is this your first time quilting? Now, your quilt is finished! Carefully go through and trim the lose threads, double check for pins, maybe run a lint-roller over it to remove small pieces of fabric and fuzz and wrap it up to be given to its new owner. *You will notice that in the first photo it appears that I am sewing a bunch of small pieces together. I chose to make one square out of a bunch of the little logos on the front of the shirts. I'm in the processing of downsizings. I don't wear T-shirts like I use to, but I have a lot of special t-shirts. There are so many things you can make with t-shirts, pillows, bags, recycling them into shopping bags, quilts, etc. I usually wear T-shirts on Saturday. I have a free pass to my YMCA through my insurance company and I can where them when I work out. I usually wear tank tops under flannel shirts in the winter. A quilt's one piece opposed to many pillows and bags. I would use t-shirts with no sentimental value as produce bags. You have to be careful with recycling cloth bags because they can carry harmful bacteria. You really need stabilizer on the T-shirt backs. They will stretch and pull with out it. You didn't accilent job of explaining! I absolutely love the idea with the masking tape. It turned out great! Excellent instruction. I would add one thing. I used a stabilizer ironed to the back of each tshirt. It. About 99 cents a yard, about 18 inches wide. The stabilizer keeps the tshirt fabric very flat and makes sewing easier (eliminates the stretch). Just a step you might consider adding. Very nice and informative tutorial. i have a bag of shirts in my sewing room waiting patiently for someone to transform them to a quilt. this is now my weekend project. Thanks! A t- shirt quilt has been on my radar but I had a bunch of baby quilts to make first. This makes it look simple. I want to try and use 2 sided shirts and match the back and front with my old cat shirt collection. I did that with old hankies and the trick there was that the designs varied by hankie size but with cutting the t-shirts I should be able to make that match much easier. The binding video was helpful. Hope your husband liked yours. You did a great job! Thanks, I have a lot of old car event t-shirts I have saved for such a project but have been very apprehensive about starting. You did a good job of explaining, now I can move on with it! Great tutorial for those of still learning. Thanks for sharing! Thank you for your instructions on the t-shirt quilt. I'm making one now for my husband - a Marine Corps/Military quilt. He has so many military t-shirts, I had plenty to choose from. It is time consuming of course, and mine is not going to be perfect (I can already tell), but it does look good so far! 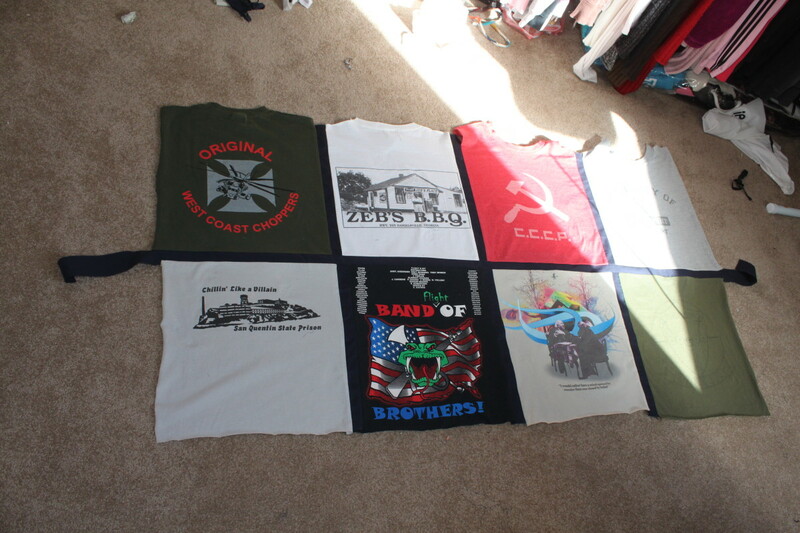 I have made numerous art quilts, but never a t-shirt quilt. Love your instructions, really helped. I have 2 granddaughters who recently lost their Daddy and they are very excited about their t-shirt memory quilts. Thank you! You really should have backed each t-shirt with shape flex. It makes the shirt not stretch. Makes for a nicer finished quilt. I have made many. There won't be any puckering in the quilt. if you are a new quilter, try to find a quilt quild or church quilting group to get hands on instruction--they are always ready to help new quilters. have to ask friends to save theirs for me. Yours was beautiful. When making a t-shirt quilt iron featherweight interfacing on the back of the t-shirt - it won't stretch or get whacked out of shape. 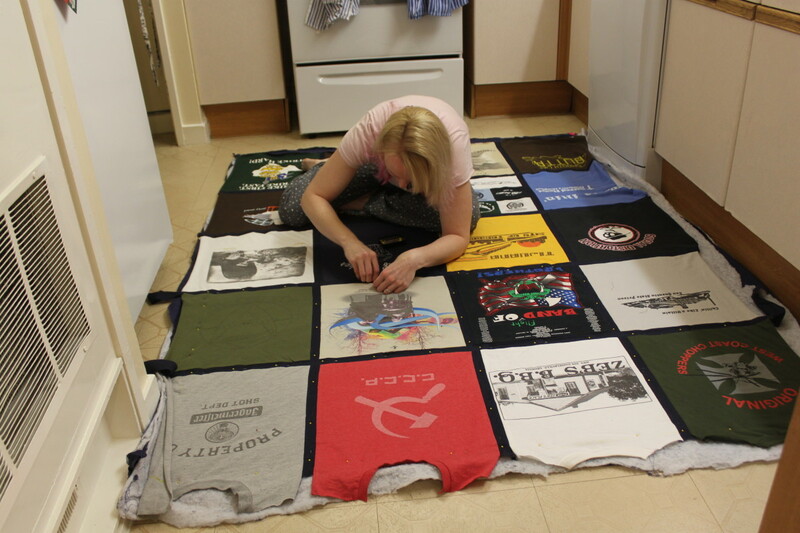 I make all my t-shirt quilts with fleece on the back. Great graduation gift. Beautiful quilt. My friend has made a couple they are so nice. I happen to find your hub because it was on my granddaughter's pinterest. Great hub. Awesome, I want to learnhow to do it, thanks. What a beautiful and clever idea. I love it! It looks easy and fun to do! Voted up for beautiful! A great use for loved, but no longer worn, t-shirts. 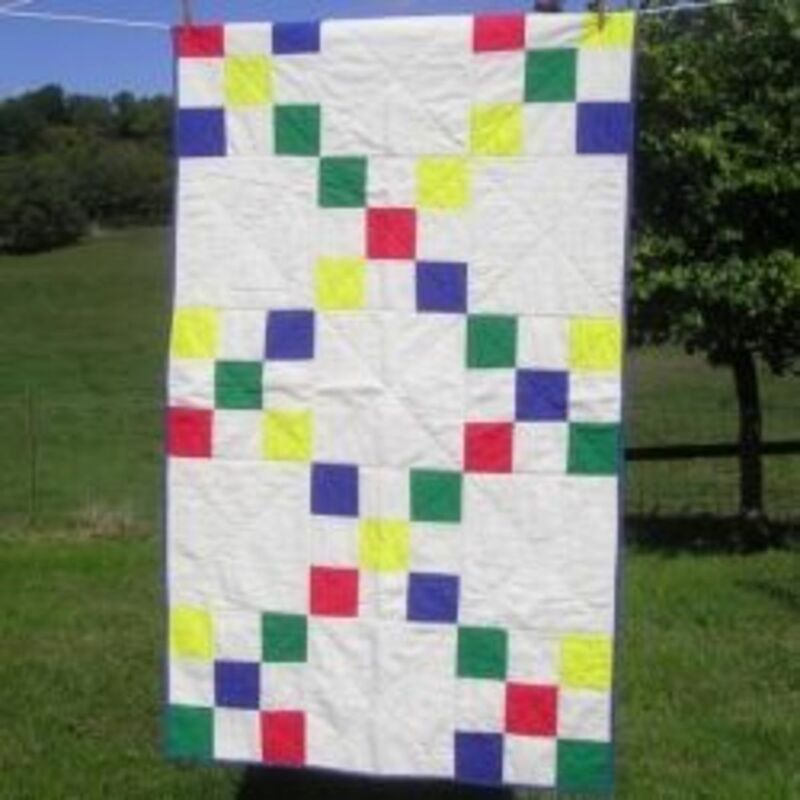 Informative article for anyone wanting to make a quilt from them. You did a great job! I like soft blankets too, and the tshirts are a great idea! Looks simple but I know the amount work involved here's hoping I can do it! I love these kinds of quilts! They are so fun and can really reflect personality more than just regular fabric. By the way, did you know that you can use fusible interfacing to make the t-shirts less stretchy and easier to work with? I've used it and it makes working with t-shirts so much easier! I love the binding tutorial video, too. It's the exact same one I used when I was learning how to bind a quilt. im a total novice when it comes to quilting and sewing. you did a great job! This looks very interesting! 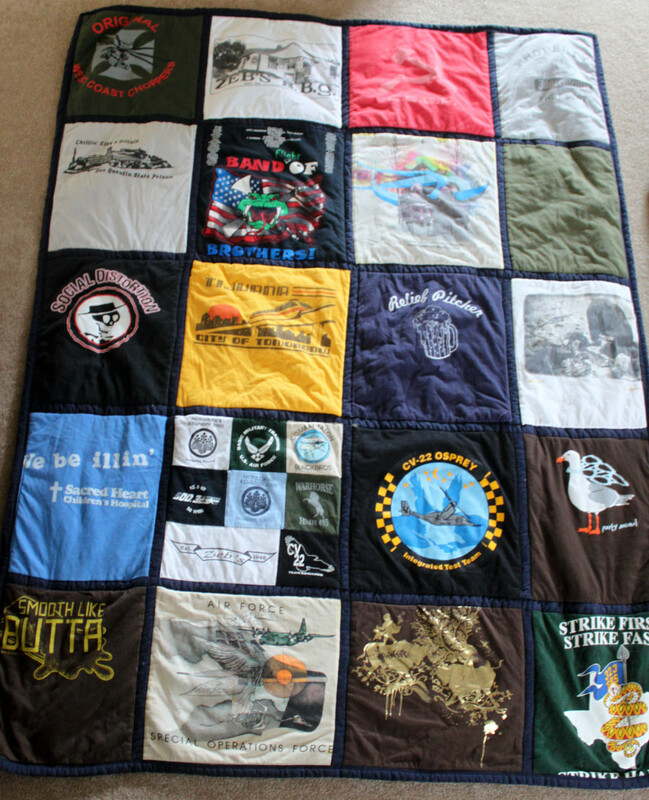 Never thought old T -shirts could be used to make a quilt. Great idea for using old T-shirts. You've encouraged me to 'step outside' the quilting box of only using 100% cotton fabric that doesn't stretch. Using fleece for the backing was inspired on your part!